The second CD contains exclusively unpublished live and studio material. On 16 May 2004, Radio Beat inducted three home-grown rock legends into its new Beat Hall of Fame. 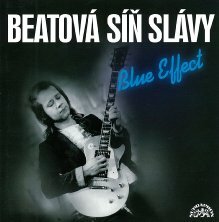 Taking their place beside the towering figures of Vladimír Mišík and Jiří Schelinger (in memoriam) were Blue Effect, a band whose profile 2 CD set was released immediately afterwards. The first disc, compiled on the basis of Radio Beat listeners’ votes, includes Blue Effect’s most popular pieces, while the second was compiled by the front man Radim Hladík together with the music journalists Radek Diestler and Vojtěch Lindaur. It contains five rarity live recordings from 1973, the composition Golem from the long-unavailable LP Staré pověsti české (Old Czech Legends) and, most notably, the bulk of the studio recordings of a series of musical settings of Jiří Wolker’s poems, which the band recorded (with guests including Jana Kratochvílová!) for Plzeň’s Alfa theatre in 1979. The extensive booklet comes with unique photographs, a detailed calendar, the producers’ notes and texts written by the band’s contemporaries Ondřej Konrád and Vojtěch Lindaur. And what’s more, over sixty minutes of recordings are appearing on CD for the very first time! The first CD is a great compilation showing the development of Blue Effect from 1969 to the early Eighties which is highly recommended not only to those who don’t want to get the whole box set 1969-1989. It starts with six songs from the band’s first and undergroundy phase (three from singles and three from the first LP) and then goes in chronological order through the bands history offering excellent guitar-based progressive Rock in different styles. The second CD is a collection of unreleased material: It mainly consists of five live songs recorded mono and in bad quality in 1973 and nine unreleased songs recorded 1979 with female vocals. The sound quality of these songs is good, but the material itself is weaker than their official releases.